The city of Athens, GA is well-known for several things: The University of Georgia, the football played in Sanford Stadium, the music scene, even just the college town feel of so many local businesses. In Athens, there is an intrinsic feeling of pride when one can take part in supporting a local business, seeing local bands perform at Athfest, or be a spectator in the Twilight bike race or the AthHalf marathon. No matter what draws someone to this city, it is definite that the town-pride felt among Athenians is unmatched. What if this sense of pride and feeling of home could be harnessed into something tangible? What if Athenians could come together to celebrate the city they love using new media? 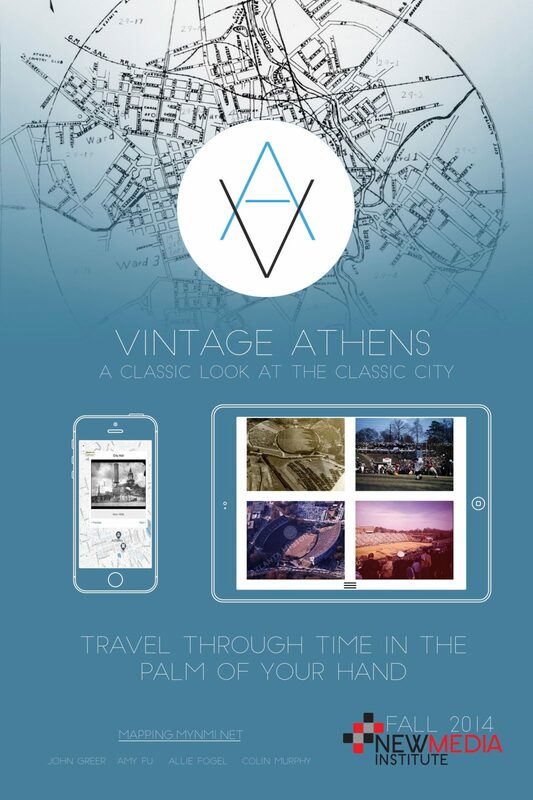 Vintage Athens is a mobile mapping app that accomplishes that goal. Userscan download the app on their phone and see how the city of Athens looked 25, 50, or even 100 years ago! Through the use of Mapbox, Geolocation, and Foursquare’s API, the app will take someone through a top-down map interface where they can choose a location in Athens close to them, view pictures of the location and watch them transform before their eyes into pictures from the past. In addition to pictures, users may also find videos and stories within the app documenting events throughout Athen’s history. You might be wondering where we are going to obtain all of these images? We are very lucky to have growing support from various local organizations who are also interested in preserving this city’s history, including The Special Collections Library at UGA and The UGA Alumni Association. However, these larger resources are only to help us get started. This project is designed for the people of Athens, and we want it to be created by the people of Athens as well. There are so many hidden snapshots and stories around the community, we believe the best way to make this project sustainable is to employ crowdsourcing. Users will be able to upload their own pictures, videos, and stories to the app for everyone to view. We believe this app will only get better and fueled with more content the more that people use it. In the early stages of development, we originally considered an Augmented Reality component that could call the camera and scroll through the years of Athens in your camera view. During the development process, we learned the technical complexity of this feature were beyond the scope of this semester-long project. Nevertheless, we wanted to share the version of Vintage Athens with the most viable yet simplistic design and functionality for the benefit of our users. Athens, GA is the perfect city to harness the pride and nostalgia in a mobile app, but we believe that this application could possibly grow into something more. The Vintage Athens Initiative could be applied to other cities around the state of Georgia with a rich history and town pride, or even be expanded to other cities across the country. We believe that Vintage Athens is only the beginning of using new media to celebrate our history.